In a case of first impression, Justice Lawrence Ecker sitting in the Supreme Court Matrimonial Part in Westchester County dealt with the issue as to whether the present income rule which is applicable in child support proceedings, can be utilized in determining the amount of spousal maintenance due from one party to a marriage to the other. In this case, the wife sought temporary spousal maintenance from the husband in the amount of $17,000 per month. Justice Ecker took note the husband’s 2012 tax return showed income of $820,000. However, he obtained a new position in 2013 because he lost his prior job through no fault of his own. His new job paid him approximately one-third of the wages he earned from his previous employment. The question presented to the court was whether it should utilize the income the husband received on his 2012 tax return, or use his present income in 2013 to determine the amount of his financial obligation for spousal maintenance to his wife. Justice Ecker analyzed the situation in the context of a child support proceeding. The present income rule is appropriate to determine child support payments. 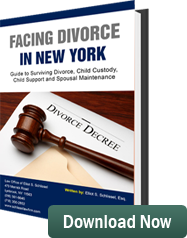 Justice Ecker reached the conclusion he could utilize the present income standard for child support payments to determine the husband’s obligation for spousal maintenance (alimony). Utilizing this theory, he found the husband’s income in 2013 would be $250,000. The wife received no income during that year. He therefore concluded that the husband should pay the wife spousal maintenance of $5,737 and not the $17,000 she was requesting. This is a huge victory for fathers. In the past, fathers were punished for being successful. The theory that no good deed goes unpunished was applicable to spousal maintenance awards. Fathers who had had high paying jobs and were then downsized were forced to pay spousal maintenance based on what they used to earn, not what they currently earned. This decision is a great step forward by this court in arriving at a fair and reasonable amount of spousal maintenance to be paid by the father in this case. Elliot Schlissel is a father’s rights lawyer, representing fathers on child support and spousal maintenance cases.